Wish us luck for next year! 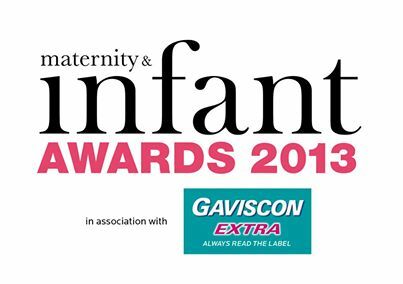 The maternity & infant Awards 2013 in association with Gaviscon Extra are Ireland’s original awards in the pregnancy and parenting industry. Through these awards we commend the very best in products and services for mothers and babies in Ireland as well as reward bravery, selflessness and hard work through twelve “People Award” categories. Now in their sixth year the maternity & infant Awards in association with Gaviscon Extra have continued to exceed all expectations with over 67,000 votes in 2012 and in line with the maternity & infant magazine, a distinct brand has been established. Following the success of the awards in the last number of years, this year we have made a conscious decision to redesign in order to improve and progress with the needs of Irish parents. This year the awards will focus on providing advice and aim to be a point of reference for parents in Ireland seeking the best services and products available to them. Through online voting, parent product testing and the maternity & infant Academy of Judges we will award the top products in Ireland the maternity & infant Awards parent seal of approval. Armed with a brand new website and six years experience we are confident in our persistence of being the innovators in this industry.